Since the topic Pokémon Go has come up in several different threads, I decided to create a thread about it. So, your Pokemans: show us them! 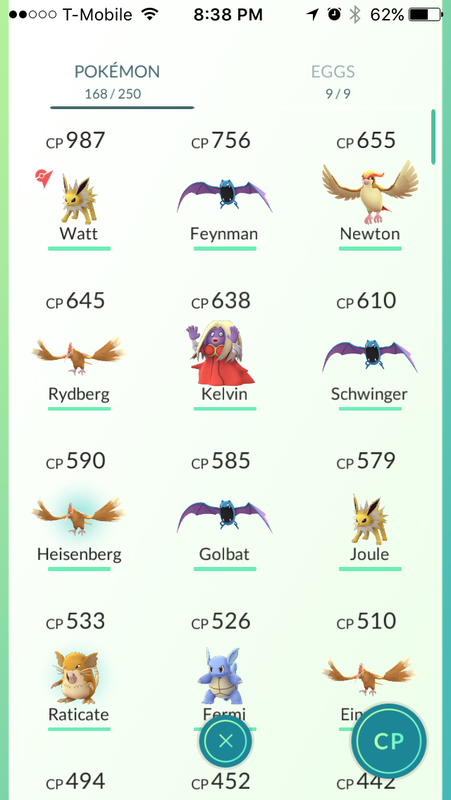 I'm currently Level 15, and my strongest Pokémon is a CP 987 Jolteon named "Watt". 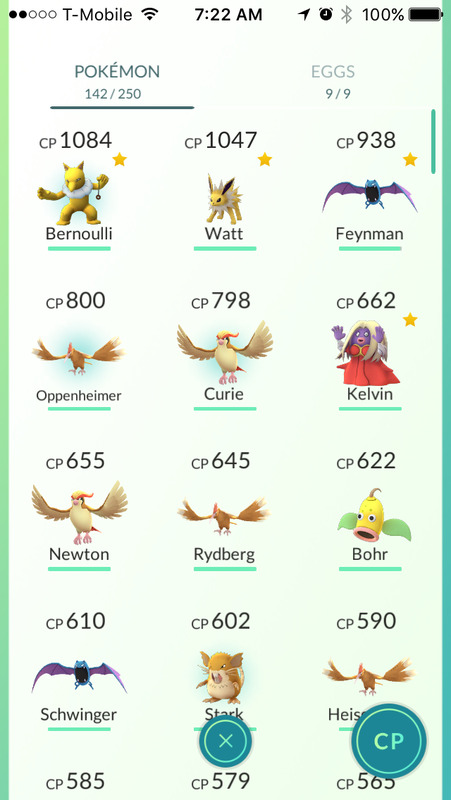 I've named most of my strongest Pokémon for various physicists. I'm only lvl 10 and I'm already getting tired of it. There's next to nothing around me and the app barely seems to work half the time. Yeah, I live in a city so there's lots around, but the game isn't very well-designed. Their servers go down all the time. I was actually surprised to be able to play it on my walk home from work tonight, since it usually goes down at 7 each evening. Bear in mind as well that Niantic, Inc. the company that made Pokemon Go has less than 50 employees and so its kind of hard for them to keep up with the maintenance demands of a game like Pokemon Go. Last night I actually thought that I need to go into town to get some Pokeballs. In the same way I'd think of needing to get milk or bread. Well, in a case like that, capacity isn't just servers and such, but people to run everything and fix it when it breaks. A many fold staff increase would have needed to start before launch to get the new people blending in. Doing this all on a speculative level would be painful in case of a flop even for a much larger company. For Niantic, it'd be suicide. "Who you gonna call? 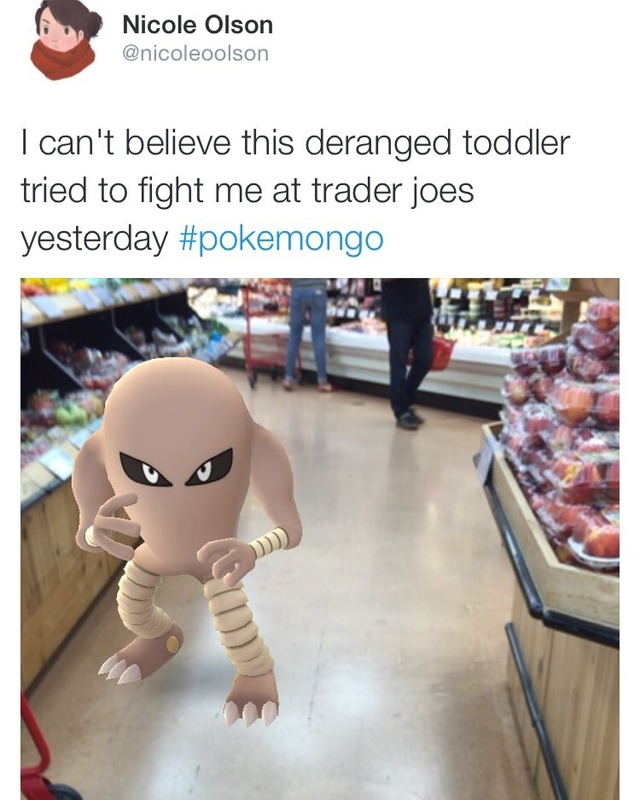 Poké Busters!" Growlithes are EVERYWHERE in Adelaide. I haven't had a chance to get out much but in one day at uni yesterday I went from lvl 16 to halfway through 18 without breaking a sweat and evolved about 8 different pokemon. Team Valor, of course. And I got a new Hypno last night! Team Have No Device to Run the Game represent! Daily reminder to stay safe while playing the game and keep an eye on your surroundings. There are some real nutcases out there. I drove a little under 80 miles today away from my hometown and of course the game has been down all day for me. Forgive me, forum, for I have sinned. Nightly from 7pm until 7am the next day, Friday 29 to Sunday 31 July, route 526 and 533 bus services will detour via local streets and some delays may be experienced while Mary Street in Rhodes is partially closed due to the large numbers of Pokemon Go players expected in the area. Apparently the White House is a pokemon gym. Thankfully that you can access from the street. Otherwise you just freaking know someone would be arrested trying to break onto the grounds and that... would not go over well. 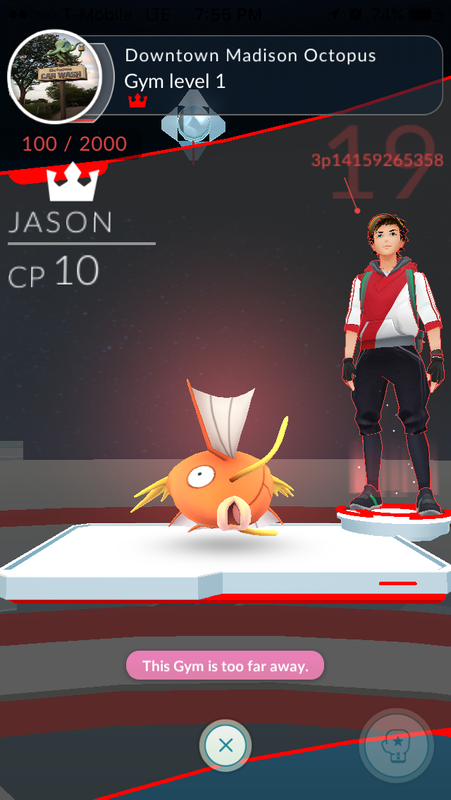 I saw a news blurb recently where someone 'karped' the White House gym with a Magikarp named 'The Donald'. 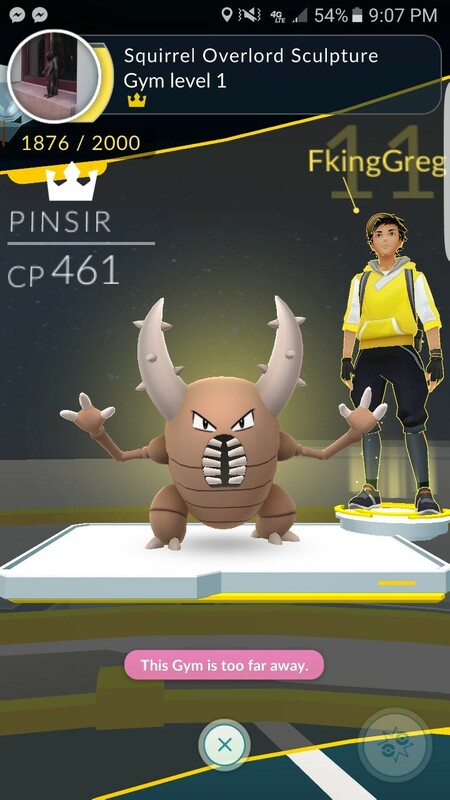 As far as I know, only you can see your Pokemon's name when it's stationed in a gym. That makes me sad at all the clever names (like "The Donald") that I'd be missing out on, but also glad that I don't have to battle dozens of Pokemon named "Fuckass". Growlithes are EVERYWHERE in Adelaide. It's because you live on Cinnabar Island. That's a pretty fair assessment. In other news I finally hatched a 10K egg that *wasn't* a Jynx! Hooray! The bonuses for getting to level 20 are pretty nice. Includes two egg incubators. I just hatched a Psyduck ( ), a Meowth (with enough candies that I could evolve a Persian*), and a Pinsir, all at the same time. *I of course named the Persian Schrodinger. Though I could use another Jynx. I want to power up the Jynx I hatched, but I'm out of candies. 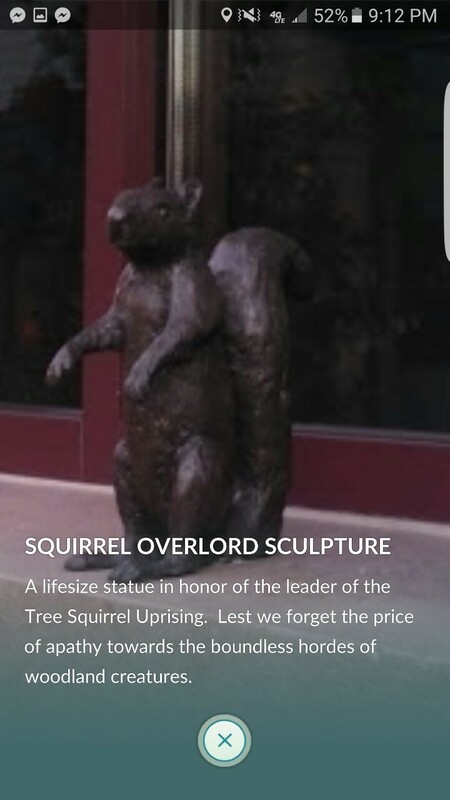 If the Gen 2 Pokemon are eventually added, I'm hoping that gym gets defended by Sentrets. Today's updates have nerfed all Dratini nests and removed tracking entirely. Also have forced third party apps/sites like Pokevision that showed precise mon location to shut down. Now my Vaporeon is useless and I don't have anything that can take down any of the literally hundreds of gyms in my city controlled by Dragonites. Also, it seems Pokemon are now harder to catch, attacking more frequently and taking far more Pokeballs to capture. I don't care so much about the loss of the pokemon tracker versus the reduction in range... Now I can't reach the pokestop across the street from my lab. The scan radius seems to have been decreased, possibly from 100 meters to 70 meters, meaning that you will have to get closer to a Pokémon in order for it to actually pop up next to you. Not a great development when paired with a total lack of tracking. Isn't it a reasonable development when paired with a lack of tracking? At least you know it's roughly within a 70m radius rather than a broader 100m radius. It sounds like it would make life a little more bearable. Disclaimer: I don't play, so take this with a three-fingered pinch of salt. It's a bit confusing because there are two radii involved. The scan radius determines whether a Pokemon will show up on the map for you to catch. The other one determines whether a Pokemon shows up in the "nearby" list, which is a larger radius (I don't know what the actual radius is, but I've heard numbers between 200m and 500m). Shrinking the scan radius means that now not only does the nearby list give no indication of how close the Pokemon is, your chances of encountering it are less than they would be before. Ah, okay, thanks for the explanation. I don't (can't) play either, but the way I heard it described was like trying to play Marco Polo with an extra rule that says nobody is allowed to say 'Polo'. I have played Ingress, so I have some vague memory of the mechanics, which I gather are pretty similar. Pretty much sums it up for me. I don't know if this is update related (it probably is) but before when I did my walk to the shop and back, I'd encounter three to five Pokemon each way. Today I only encountered one coming back. Really don't like just getting rid of the steps for nearby either. The first week I kept running into a Squirtle in the same spot, sadly it went away a few days later and would always run from me. 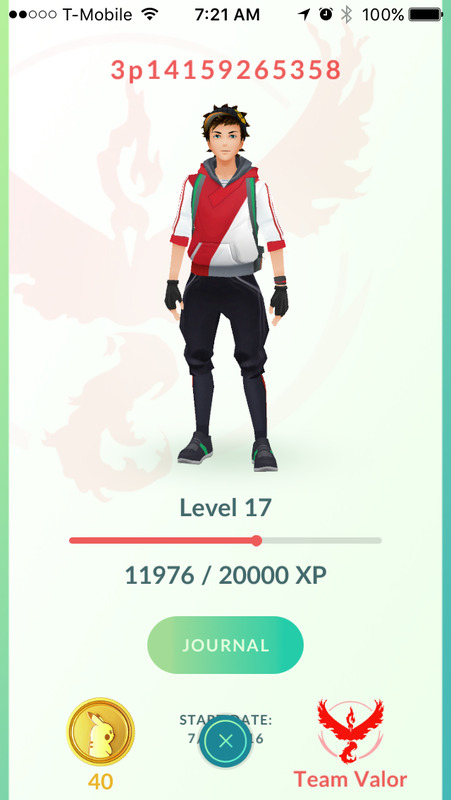 Seems to have fixed a few things, although they've sent Cease and Desists to pretty much every site that's pokemon go related like PokeAdvisor, which you could use to calculate your mon's Individual Values (IVs) and was basically just a companion thing that didn't alter the game in any way at all. I got a gym for five minutes a couple days ago. Felt so proud. I'm debating changing my name because I put my legal name in it and I don't mind too much but my name is uncommon enough and my town is so small that someone might be a smartarse jerk somehow. Although that might be me being paranoia and anxiety. The gyms around here turn over really quickly, so I don't bother trying to keep a gym and just park something weak there just long enough to collect a bonus. One of the guys in the lab has started a local trend of Pikachu-ing gyms (he has a pile of CP100-ish Pikachus he uses for the purpose). I have no Pikachus, so lately I've been Bulbasauring gyms. I guess that karping must already be passe. Judging from something I saw on twitter, apparently the new meta is to put a cp100~ Magikarp so people are cocky and follow it up with some cpXXXX Snorlax for multi-pokachu gyms. Yes, karping. It's apparently the pokemon version of ada-trolling. I actually pretty much understood this in spite of the jargon, but the phrase "the new meta" made me feel old.